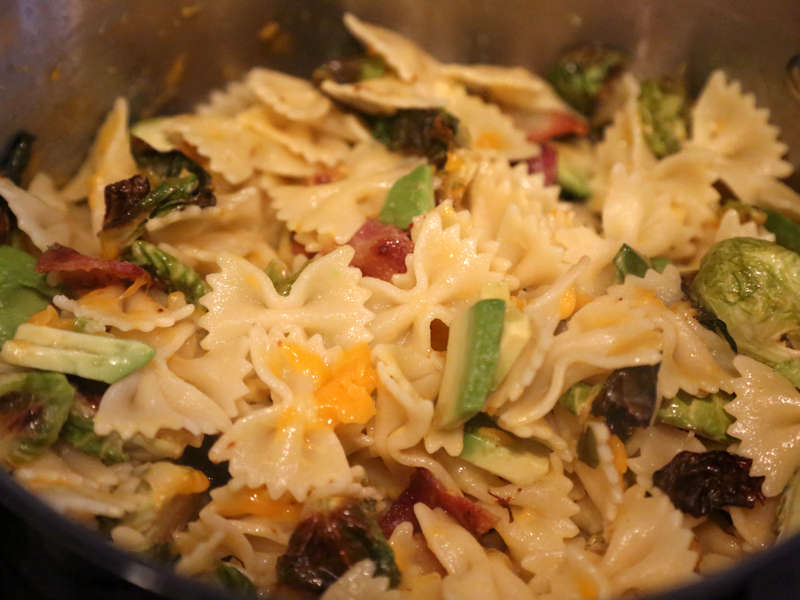 This pasta combines a few of my favorite things: cheddar cheese, avocado, brussels sprouts and bacon. This filling dish makes a great dinner that comes together in 30 minutes or less. I use all natural, reduced-sodium bacon. And I use paper towels to remove some of the bacon’s grease once it is cooked. The brussels sprouts bake in the oven while the pasta cooks. Some of the leaves on the sprouts may crisp up, and that’s OK. I like using bow-tie pasta for this meal, but rotini or penne could also work well. After the bacon, sprouts and pasta cook, then you stir all of the ingredients together and serve. Slice the brussels sprouts in halves (or quarters if they are large). Bake the brussels sprouts for 20 minutes in the oven on a greased baking sheet. Cook the pasta (15 minutes). Pan fry the bacon until well cooked (about 10 minutes) over medium low heat. Drain on paper towels and cut into small pieces (about half and inch). Slice half of the avocado and cut slices into thirds. Mix all of the warm ingredients together in a pasta pot or large bowl. The cheese should melt as you stir. This recipe easily serves three people or two with leftovers. No Replies to "Favorite things pasta: cheddar, bacon, brussels sprouts and avocado"